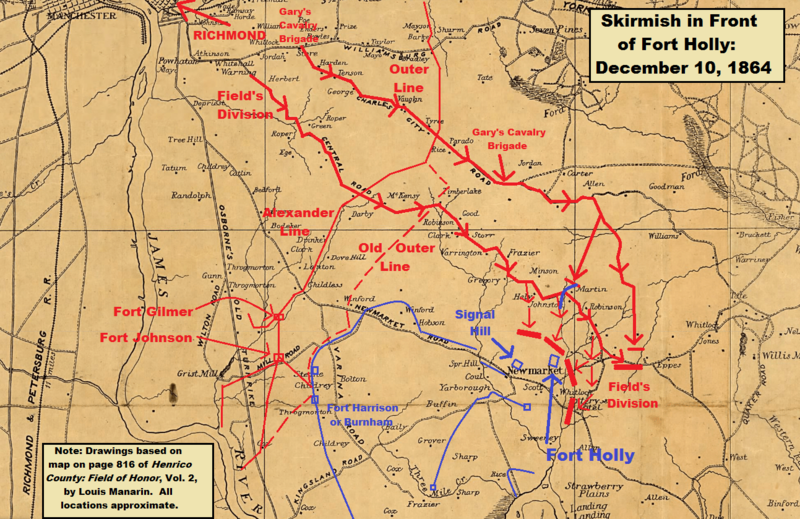 On December 10, 1864, 150 years ago today, the Confederates launched a rare offensive of their ownat this late stage of the war. Confederate signal men had spotted many of Benjamin F. Butler’s men leaving Bermuda Hundred and the trenches north of the James, and Robert E. Lee wanted to find out if Grant was abandoning positions north or south of the river. In reality, Butler was taking one White division and one Black division of his Army of the James to use in an attack on Fort Fisher. In addition to Butler’s movement, Gouverneur Warren was moving back the way he came after a successful expedition to destroy portions of the Weldon Railroad between the Nottoway River and the Meherrin River. Wade Hampton’s Confederate cavalry and a large intercepting force of Third Corps infantry under A. P. Hill were chasing Warren back to his lines. Robert E. Lee ordered James Longstreet to take Field’s infantry division, a battalion of artillery from E. P. Alexander, and Gary’s Cavalry Brigade, and probe the Union far right along New Market Heights. Hoke’s Division would be held in reserve, and Kershaw’s Division would take Hoke’s place in the lines should he be needed. At 4 a. m. on the morning of December 10, 1864, Colonel Thomas M. Logan took Gary’s Brigade down the Charles City Road, headed east to cover Field’s flank and probe the picket lines of Yankee cavalrymen. At 5:30 a.m., to the troopers’ south, the five brigades of Charles Field’s Division (Bratton’s SC Brig., Texas Brigade, Benning’s GA Brig., G. T. Anderson’s GA Brig, and Law’s AL Brig) took the Darbytown Road, or Central Road, pushing east and then eventually south against Fort Holly and Signal Hill on New Market Heights. They reached their destination around 2 p.m.
Longstreet pushed in the First Brigade, Kautz’s Cavalry Division, Colonel Robert M. West commanding, which was picketing the Darbytown Road in the vicinity of the Johnson House. West’s men retired south to the earthworks in front of Fort Holly and Signal Hill, where he was joined by Franklin A. Stratton’s Second Brigade. Bratton’s South Carolinians an the Texas Brigade attacked several times in probes, feeling for any weak spots. Longstreet recognized that these fortifications were thinly held, but he also saw the that the forts themselves were strong, too strong to risk an attack. In addition, with the freezing and inclement weather and his men in poor clothing, he didn’t want to expose them to the elements any more than was necessary. Choosing a prudent course, Longstreet ordered his men to head back west up the Darbytown Road, ending the skirmishing and the reconnaissance in force. Lee and Longstreet gave up the idea of any successful assault on the Union lines north of the James as a result of this probe. OR XLII P3, pages 1260–1267: For the Confederate perspective on this mini-offensive.